← Is Place des Vosges really the nicest square in the world? We were admitted into the Kings Chambers. This time it was closed to the daily viewing, it made it very nice as we were able to see the rooms without the huge crowds of earlier in the day. They moved us through the various rooms at a steady pace but since there were no crowds we were able to see the chambers very clearly so it was most enjoyable. They had a rope that everyone held onto and we all moved along until we came to a stop in turn and this would be our place to view the serenade. We were so lucky that our place was near an open window with a cool breeze coming in. There was a wonderful group of musicians in period costume. My feet were absolutely worn out from earlier in the day and I realized that I would have to go around to the fountain show later. I noticed some children sitting on the hardwood floor and decided that I would do the same, that way I could rest my feet for awhile and get up when the dance started. After I did this I noticed lots of adults joining me on the floor so I was not alone. Most people continued to hold onto the rope. The sun was setting and reflecting off the crystal Chandeliers and mirrors. The shadows were flickering across the wood floor and the sun was back lighting the people on our side of the room. The music was relaxing and it was like stepping back in time in luxury. Then the serenade began. The dancers were in full period dress and it turned into an evening to remember. The dancers were very good at what they did all in silk and lace. It was very hot and sunny and no air conditioning so some of the male dancers were really perspiring as they danced and danced. At the end the dancers, led us children first, into the ball room. Al and I both took lots of stills and video clips and a man took a picture of us at the end of the show. I was glad that he did this as it was nice with the hall of mirrors and the chandeliers in the background, as the sun was setting. Because of all my rushing around during the day I had sweated off all my makeup and looked a little red faced but it was a wonderful souvenir. It felt as if I were in the hall of mirrors at a luxurious ball in the past. With all the opulent surroundings and such beautiful things all around it is beyond words to express how lovely it all was. It is a must do as all the stories and pictures cannot come close to the feeling of being there. This was definitely a highlight of the trip to Versailles. 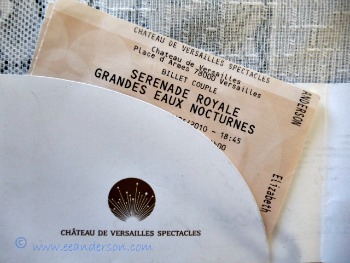 It was so pleasant an experience and I would highly recommend it. 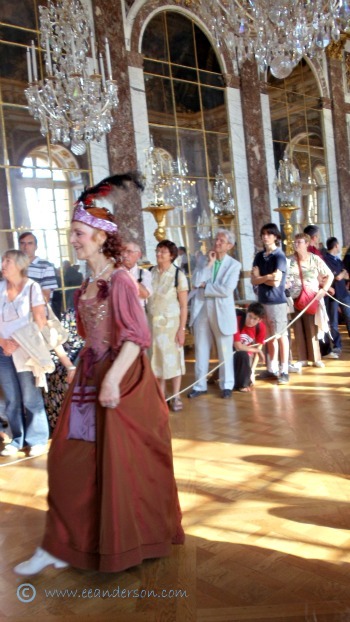 This entry was posted in France, Travel, Versailles and tagged Chandelier, Chateau Versailles, Dance, France, Hall of Mirrors, Performing Arts, serenade, Versailles Palace. Bookmark the permalink.